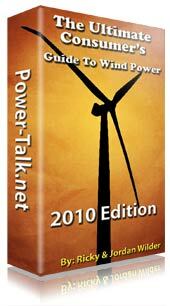 Jan 2010, Issue Number #004: The Power Report – New Turbine, Fresh Content and Updated eBook! 1.Our New Wind Turbine... Sort of. Well, it's been a quite a while since our last newsletter. Let's just say we had a very long, work intensive summer. In our last newsletter I explained the demise our turbine, then left all of you in suspense about what new turbine we would choose. We did get a new one but not a different brand. To make a long story short, (the long version is in the ebook) SWWP decided to replace our turbine with a new brand one. Even though it was still under warranty, a direct replacement was a surprise to say the least. 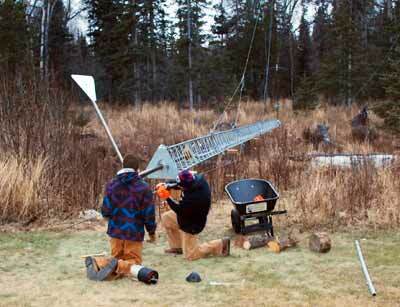 We got the new whisper 200 up and running just before the snow fell. I guess the adventure of installing a different turbine will have to wait - then again, that's a good thing right? 2. 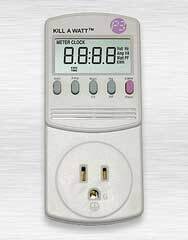 Kill a Watt Electric Monitor Review. 3. New Revised & Updated 2010 Edition of "The Ultimate Consumer's Guide To Wind Power"
(NOTE) On the sales page we list every wind turbine manufacturer that we review (and their turbines of course). We are also working on selling the "wind turbines reviews" section separate at a lower price. That way if you already own the full Consumer's Guide to Wind Power you won't need to purchase it again just for the reviews. I will keep you all updated on when we will have the Wind Turbine Reviews ebook for sale.